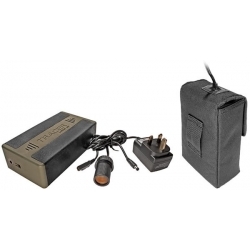 Lithium battery packs offer tremendous advantages over traditional sealed lead acid SLA batteries. Lithium battery packs have improved power delivery as well as being one third of the weight when compared to the sealed lead acid equivalent. The lightweight battery pack is enclosed in an attractive greenand black shock absorbing case, designed to slip easily into a large pocket or into the included outer canvas case. •The built in fuel gauge lets you know how much power is left in your battery. The built in fuel gauge lets you know how much power is left in yourbattery. Simply press the button to illuminate the display giving anaccurate indication.Intelligent fuel gauge let’s you know the power status of your Tracer battery. Tracer Sport Light 170 Hunting Lamp.